Alters the values of the vast majority of armor, clothing, and weapon pieces. 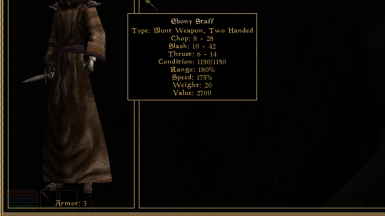 This mod drastically overhauls the values associated with armor, how they scale / relate to each other, while rebalancing cost and enchant values. Generally speaking, a factor that holds back balancing enchanting is that the power that Enchanting should be expected to achieve is far higher than the respective of enchanting. With Enchanting now having a power cap close to what a player can get without buffs, Enchanting can now be balanced around its power progressing close to the spells they compete with. All weapons/armor pieces, even enchanted ones, should at least be sellable to the Mudcrab Merchant. With that as a baseline, all other late-game items below the most expensive can be scaled down accordingly. Early game, gold can be hard to come by. An iron weapon can still be valuable enough to purchase, and hauling back weaponry shouldn't broadly be unnecessary for what any one of them can do, so they, and items like them, get to have a bit of a higher price. And scaling everything smoothly in between makes sense for how most other values (Health, Damage) are also scaled in that way. Summaries with closer to exact details can be found in the misc downloads section.